The mp3 metronome tracks have now been replaced by YouTube videos that can be played on all devices, including computers, phones, and tablets. There are now several improvements over the old mp3 file with many metronomes available: standard metronomes, talking metronomes, and subdividing metronomes. They include a wide range of tempos and have been recorded at a loud volume, so you can hear the sound clearly. You can access all of these metronomes for free at my new site, www.MusicAllTheTime.com. These YouTube clips are a transition from the old Flash-based MetronomeBots. See my blog for information on the future of Flash and MetronomeBot. As always, have fun! 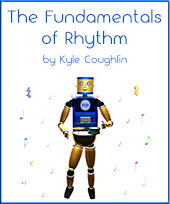 Visit www.Rhythm-In-Music.com for an educational site that explains all of the fundamental aspects of rhythm. The site also includes more than 450 practice patterns with audio examples, designed to help you improve your rhythm skills.